We have reached a point in which we have helped many of our clients with their irregular situation as immigrants in Spain, getting their residence permit in order for them to be able to legally work and live in the country. One of the easiest ways to achieve this regular situation, if you have been living in the Spanish territory for a while, is the arraigo social. In this post, we will answer the 12 most frequent questions that our clients make us regarding the regularization in Spain. Are you ready to clear your mind up? What is the arraigo social? The arraigo social is a residence and work permit design specifically for those individuals that have been living a minimum of 3 years in Spain, and that are living in an irregular situation. Which are the main requirements to get the arraigo social in Spain? How can I apply for the Spanish residency through the arraigo social? Due to the manifoldness of documents and procedures necessary to get the arraigo social during this 2018, we would highly recommend you to trust a group of lawyers specialized on immigration in order to let them manage all the paperwork for you. This will not only save you time and money but also will provide you with clear guidance in each step of the way regarding what exactly you need to do next in order to solve your irregular situation as an immigrant. We have been helping individuals like you through many years in Balcells Group get their residence permit, so do not hesitate to contact us if you want to obtain your arraigo social as fast as possible. How long is the process of the arraigo social? Usually, the whole arraigo social procedure lasts between 3 and 4 months, since we start with the paperwork until you get your residence permit to live and work legally in Spain. How does the arraigo social for freelancers or self-employed work? There is no such a thing as the arraigo social for self-employed individuals. In order to stablish yourself legally as a freelancer in Spain, you cannot be in an irregular situation. This is why once you have obtained your permit through the arraigo social, you will then be able to jump into realizing economical activities under the situation called “por cuenta propia”. How to get an appointment for the arraigo social in Catalonia? In order to get an appointment for the arraigo social in Catalonia, you can use the in-line system called 1/10/2018, which will enable you to request an appointment online, once you have all the required documents. Which are the requirements necessary to renew the arraigo social permit? You cannot renew the residence permit achieved through the arraigo social. The Government will provide you with a permit for 1 year, and after that period, you can modify it and jump to “cuenta ajena” or “cuenta propia”. How much does the arraigo social procedure cost? At Balcells Group we manage the whole arraigo social procedure for you for just 500€ + VAT, accompanying you step by step and eliminating any tedious paperwork action required. You would just need to sign! How can I check the results of my arraigo social application? You can get to know if your arraigo social application was approved through electronic notification. In the case that you rely on our lawyer team to handle all the procedure, we will make sure that we call you right afterwards your application has been approved. Where do I solicit the arraigo social for immigrants in Spain? The arraigo social application must be sent out to the foreigner’s office located in the province you are living in. How much time do I need to be in Spain in order to get the arraigo social approved? If you want to get your residence permit through the arraigo social in the Spanish territory, you will need to reside in the country for a minimum of 3 years. What do they ask in the interview for the arraigo social procedure? Basically, during the interview for the arraigo social application you will be asked questions like what are you doing in the country, how much time have you been living in the territory, if you have any relatives here, etc. Their main purpose is to make sure that you understand Spanish and Catalan (provided that you live in Catalonia). 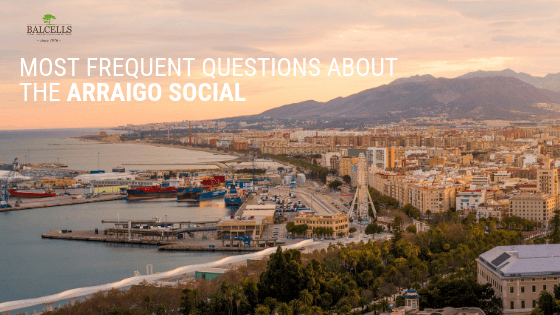 This has been the 12 most frequent questions our clients make us regarding the arraigo social. Nevertheless, we want to solve all your doubts. Do you still have any question regarding the regularization in Spain? Then do not hesitate to leave them on the comment section down below, we will answer them carefully! You do not talk about having 2.500. Euros in the bank for 12 months, nor do you mention about proof that you have 25.000 in bank, stock market, or bonds, need to hear back. Darrell Calvin… you have my five hundred euros. Hi Darrell, this post it’s for information only. For this type of procedure, they also required a job contract. I should’ve searched further and find this website earlier rather than getting the service of the rude lady lawyer in one of the law office in Gran Via. I’m pretty sure I will be satisfied here than there. We will make our best to really satisfy you and help with everything you need. You just need to ask us! I want to know , i am living here in spain from last almost three years.I having a schengen visa from Germany on my passport so please tell me do I also need a police clearence certificate from Germany ?I am from India .I shall be thankful to you . How do I get a contract of work when puting in for my resident in Spain? You will first need to find a job offer in Spain. Then, the employer must do the initial application. For any other doubt, do not hesitate to contact us at info@balcellsgroup.com, we will be glad to help! You are talking about two different processes, one is the Spanish reunification (your parents can apply for you if they already have a residence permit for the second year, meaning that they have renewed once the first one; and then the arraigo. The application process for both is completely different. thans for reaching out to us!